One of the good things is the ‘Open Home’ system. The owners are kicked out and the estate agents take over for a short time allowing the public to just turn up and have a look around the property. Following a chat with an estate agent whilst viewing a property we have decided to look into building our own home if we can find a suitable piece of land. Looking at the adverts does not give you much hope for some properties, the photographs can bear no relation to the property at all. 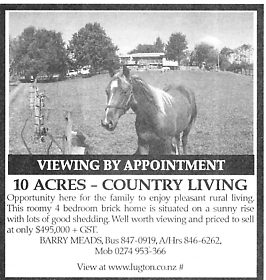 We have seen one where, of the 12 photos, 10 were of horses in the paddocks attached to the house!!! Others show the view from the property making you drive round (if you can find it) to look at a totally unsuitable bit of land where mountain goats would find it difficult to cope with the slope let alone build a house. University Graduation is celebrated in style over here. Peter saw part of the graduation ceremony for a group of students from WINTEC (Waikato Institute of Technology). They were marching in Cap and Gown up the main street in Hamilton behind a Pipe band in full Scottish Regalia. We think we’ve finally sussed the GP system. Basically you pay, pay and pay. You pay to go to the doctor, pay for a prescription and then pay for the medication (so it pays to get multiple requests). There are very few non attendances at the Health Centre here though! Teacher aides in NZ are untrained classroom assistants (there are no trained NNEB’s). In special schools they get an allowance for working with students who are incontinent – $3.50 per dirty nappy per day (only one claim per day though). The wildlife around here is a bit more exotic than the UK. 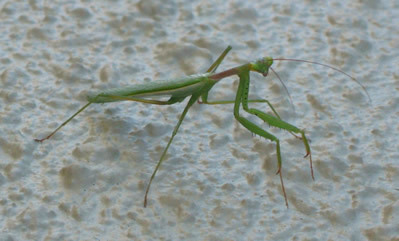 We hear Cicadas (Kihikihi) whenever the sun shines and whilst putting out the washing Peter found this Praying Mantis on the garage wall sunbathing. Many of the traffic lights have filter lanes for turning left or right. You have to keep your wits about you to make sure you follow the correct set of lights. Mind you if you end up in the wrong lane just do what any true Kiwi does – a U turn in the middle of the traffic! Sport is big in NZ for children. Not only are there the usual after school clubs every night of the week but many schools run before school clubs too – starting at around 7am. Rowing is a major activity in Hamilton. We see crews on the river both whilst we are on our way to work at 7am and on our way home in the evening. There are also joggers around at all times of the day. Cycling is popular with many kids cycling to school and we see quite a few cyclists on the way to work. Two of the local schools were on top in the recent rowing championships held just down the road at Lake Karapiro. One of the Weathermen on TV is a little bit odd. In a recent forecast he used the phrase “So we can say goodbye to the showers in Wellington. Goodbye showers, hello sunshine.” We await his pronouncements with interest. Peter has been given a company car so we don’t have to buy him a new ute in the near future. Ann wants an mpv when the house sale goes through leaving ‘Butch’ to be retired (what she’ll do with the extra 5 seats is anybody’s guess). One of the major annual events in Hamilton is the “Balloons over the Waikato” festival. Although we were away for the weekend at Poronui Ranch (click here to find out what we did!) we saw plenty of balloons early in the morning whilst on the way to work, or late in the afternoon on the way home. Instead of Remembrance day in November we have ANZAC day on the 25th April. The day commences with a dawn parade of veterans through the town with another ceremony later in the morning. All shops and businesses are closed as a mark of respect. Poppies are sold to raise funds for the Returned Servicemen’s Association. Autumn is finally here, Peter had to scrape ice off the windscreen of his company car early in the morning. The temperature still got to 19 degrees during the day though.